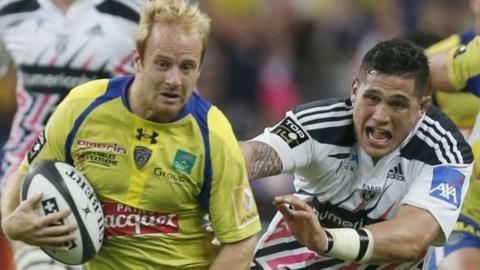 England's policy of not selecting foreign-based players is "criminal", says Clermont full-back Nick Abendanon. The Rugby Football Union only allows players from overseas clubs to be picked in "exceptional circumstances". "By not making their best players available they're not giving themselves the best opportunity," Abendanon said. Reigning European player of the year Abendanon and his predecessor Steffon Armitage of Toulon were both left out of England's World Cup squad. Host nation England were eliminated at the group stage after suffering a 33-13 defeat by Australia on Saturday. "The most upsetting thing for me is the fact that England haven't given themselves the best opportunity to win the World Cup," Abendanon told BBC Radio 5 live. "Lancaster had his reasons - I think he may have had his hands tied by the RFU. But for me the decision not to select these players is pretty criminal." Australia revised their own selection policy before the World Cup to enable them to include some overseas players in their squad and Abendanon, who won two caps for England in 2007, believes England should have followed suit. "The Australian coach [Michael Cheika] has run through walls to make sure he can select the best players at his disposal - to me that's someone who wants to win a World Cup. "In moving to Clermont, my rugby has improved a huge amount. To be told that you can't go and play in another country - that's not good for English rugby."